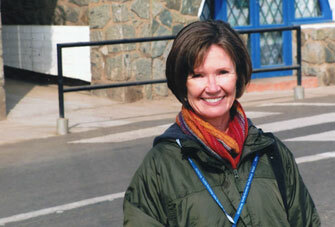 Cathy Crosby, a CFCA board member, joined Walk2gether during the last leg of its journey through Chile. Here is her reflection on the nearly 8,000-mile walk through 12 countries to show solidarity with those living in poverty. CFCA President Bob Hentzen’s words gathered us in a circle hours before dawn in the rain, the morning of Walk2gether’s last day. Dead birds and dry riverbeds along our route had offered silent witness to the plight of the people. Gratitude for the rain underscored our thanks for months of safety, the gift of one another, and most of all the countless gifts from sponsored friends and their families. 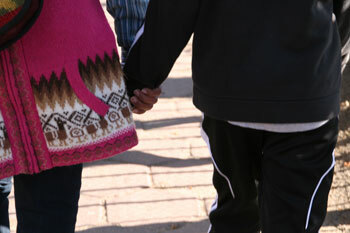 Connection, connectedness and unity (not uniformity) are threads woven through my Walk2gether experience. These words hint at, but fail to capture, the profound interconnections that are the heart of CFCA. CFCA and its Hope for a Family sponsorship program are built on loving relationship, beginning with Jesus’ love for his heavenly Father, his earthly parents, each person he encountered, and extending to all of creation. As a sponsor, I have been privileged to travel to Guatemala and Kenya to be with my sponsored children and their families. That relationship is foundational. Our prayers, letters and photos keep us connected. Walking is a powerful reminder of our connection to our earth as well as one another. When walking in darkness or slippery mud, we must take care with each step, often directly in the footsteps of the walkers in front. Those following will step into our footprints. In daylight we share creation’s countless small gifts: a lingering wildflower, a spectacular cloud formation. Gravity grounds us and binds us to our planet, yet our spirits soar as each mile unites us as companions on our life journeys. A sliver of fingernail moon, waves crashing over the seawall, distant mountains and huge sand dunes: these images integrate each physical step with an awareness that our careless misuse of God’s gifts contributes to the burden of our sisters and brothers living in poverty. The rhythm of our days made walking sustainable and enjoyable. Our initial hours of silent walking offered the perfect time for prayer and reflection. Approximately every 3 miles (5-6 km) we met smiling, clapping CFCA-Chile staffers and bountiful refreshments. Fruit, cookies, coffee, tea and a few surprise treats sustained us each morning. A 30- to 45-minute break let us care for our feet and chat with one another, sharing Walk2gether and our stories. One of many daily miracles was a hot roadside lunch by Chilean mothers on tables set with colorful tablecloths, real plates and utensils, even including dessert! The love with which they prepared and served our meal nourished us as much as the food. Our days ended by nightfall, and our efforts were rewarded with God’s glorious sunsets. The evening meal let us relax together, anticipating the next day and resting in gratitude for this one. Bob’s wife, Cristina, and her granddaughter walk during the last day of Walk2gether. Walk2gether offered me the opportunity to visit Edna, a bedridden but lively elderly woman, sponsored by a friend of mine for 13 years. We brought my friend’s photo into the room, and our conversation about her allowed her to be present with us in a palpable way. The sponsor-to-sponsor connection was another highlight. We shared stories of our sponsored children and aging, our growth in faith through sponsorship, our sharing of the CFCA story with others in multiple ways. Both Kansas City and Chilean staff walked with us; seven countries were represented along this final leg! Several of Bob and (his wife) Cristina’s family members accompanied us, and their strong bond graciously included all. The joyful commitment of Bob and Cristina’s young grandchildren powerfully reminded us of our connection to CFCA’s future and the many still waiting for sponsorship. Gratitude. Reflecting on my Walk2gether experience will continue for the rest of my life. I’m grateful for the countless gifts by families, staffers, and Bob and Cristina’s profound witness to Jesus’ love, through joining my steps physically and metaphorically with so many others. Gracias por compartir estas reflexiones tan hermosas…..
What a beautiful account of a wonderful experience. I am typing this through my tears.